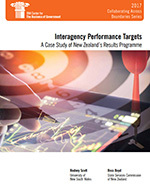 From 2012 to 2017, the New Zealand government has held groups of senior public servants collectively responsible for achieving performance targets for improving persistent crosscutting problems. New Zealand has been a beacon for government reforms for almost three decades. While the New Public Management Reforms of the late 1980s made agencies more efficient and responsive, they also created a new problem; agencies struggled to organize effectively around problems that crossed agency boundaries. New Zealand undertook a new round of reform in 2012 to address ten important and persistent crosscutting problems. In this report, Rodney Scott and Ross Boyd describe the approach, framework, and results of the initiative. They also offer practice insights that can be helpful to other government pursuing similar objectives. Watch our video interview with Rodney Scott! Read an article about this report in Australia's newsletter for public servants. Read an article about this report in the Global Government Forum.